MINNA SÄRELÄ is a founder of Finnish design collective PALONI, which is coming to New York this weekend to open a pop-up store during the fashion week. PALONI shop will be open through the end of February at the Ivana Helsinki NYC Concept Store. Their motto is: YOU CAN CALL IT DESIGN, INDIE FASHION, ART OR HANDICRAFT. WE CALL IT PASSION. Firstindigo&Lifestyle: Minna, I was so happy to hear that PALONI is coming to New York, tell me little bit about this ‘invasion’? Minna: I founded Paloni one and a half years back, and lately started to feel that it’s time for the next step, broadening our scope and doing the first international project. 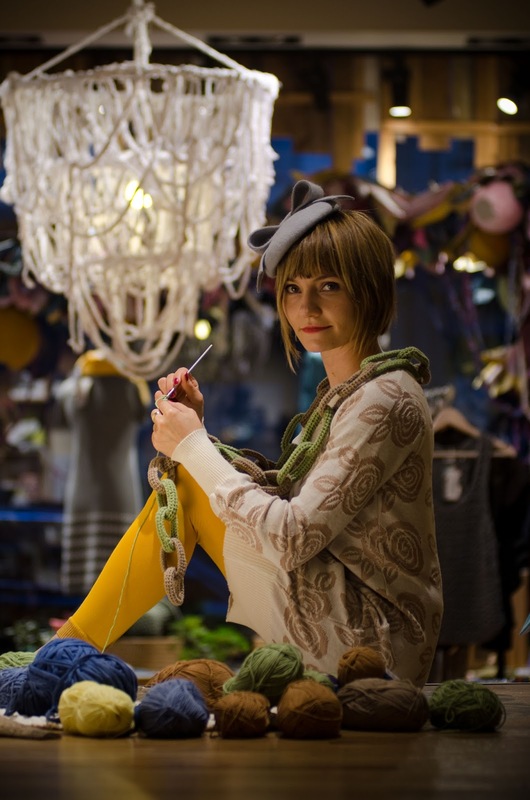 New York opened as an opportunity through another Finnish fashion company Ivana Helsinki. After I got to discuss with their crew, things started going forward very fast. Our designers are very excited about this project and the possibilities it offers. We had a total of 37 Finnish designers joining the project, despite a very tight schedule for the preparations. Now it’s not just my project anymore, it’s something we do together. We have a group of 20 Finnish designers coming personally to New York, and together we will promote Finnish design and fashion know-how, build a pop-up store within the Ivana Helsinki NYC Concept Store. We will organize events and parties, network and build ourselves wider horizons for future dreams. Firstindigo&Lifestyle: When you started the company-collective, who did you include, was it by invitation and with like-minded people? Minna: When I started, I had 45 designers that I represented. Now I’m trying to settle the number at about 80, although there would be much more demand and need from the designers’ side to join this kind of a platform or network. Still, I think it makes more sense both to our designers and customers that we can concentrate on the people we represent. At first all of my co-operations with designers started by finding interesting labels or designers, and looking for cooperation. Now I get many requests every week from designers who would like to cooperate. I try to answer them all and to help them all, even if I think there’s something about their line or products they should still work on before going to the market. Firstindigo&Lifestyle: HOW INTERNATIONAL IS PALONI? Minna: I see Paloni as “born global”. Even though we’ve only operated in Finland so far, our way of communicating in English, and with international vibes, have brought us international customers and connections, and made our network international. Also our designers come from across the globe, although this New York project concentrates on making Finnish designers’ skills better known. Firstindigo&Lifestyle: I learned from your website that you have been participating in eco- and sustainable fashion events, what have you learned about this field, and what are your thoughts about this trend? Minna: I really wish it will not be just another trend among others, but rather a chancing force that will make the whole industry into something different and affect our behavior profoundly. I feel there’s much need for making ethically and ecologically sustainable options available and better known. I don’t believe the change comes from pressuring or from being negative. It needs to stem from each one of us. Personally, I feel that wearing a garment I respect in all ways makes me feel more balanced and respected, too. There’s a lot of discussion and information around this issue, and I’ve learned so much about the debates and aspects in the past years. However, I think offering information will not change it very much – we already get too much information every day. I think we rather need some easy and pleasant ways of loving fashion more sustainably. By bringing together tens of designers that represent this ideology and by offering their offerings as a holistic array and experience, we try to build sustainable design in a pleasant way, and include a wide enough collection to be part of it. Firstindigo&Lifestyle: WHAT ARE YOUR NEW PROJECTS WITHIN PALONI, AND YOUR EVENTS? Minna: Simply teamwork. By doing things in a committed team and by supporting each others’ potentials we can reach much more than with big money. The word ‘Paloni’ comes from the Finnish word “my passion”. When you have passion for something, it shows. And when it shows, others get excited too. And when that happens, impossible things become possible. Firstindigo&Lifestyle: What do you expect from your visit in New York, how many times have you visited? Minna: Although I haven’t been in New York many times, it’s one of my favorite cities in the world. I think each one of our designers have big and very different expectation. Personally, I expect networking, finding new inspiration and ideas, -these two things combined can lead the way to something new and unexpected. Firstindigo&Lifestyle: Is Paloni hoping to bring the products here, or will operate via the e-shop? Firstindigo&Lifestyle: Welcome to New York! Minna: Thank you! And welcome to our opening party on Wednesday Feb. 13th at Ivana Helsinki NYC Concept Store! We will have DJ Fiona Timantti playing Finnish music, and you’ll have the chance to meet our designers in person.